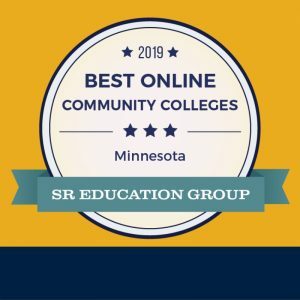 Northwest Technical College was recognized by the SR Education Group as one of the best online community colleges in Minnesota for 2019. NTC partners with Distance Minnesota to offer many online classes and programs. A completely-online program can work well for most students, while others prefer a blended schedule where some classes are taken on campus, and others taken online. NTC is a technological learning organization that is open and inviting through its many associate degrees, diplomas and certificate programs in business and entrepreneurship, health and human service and science and technology fields. Guided by a commitment to excellence through education, students are prepared to meet the evolving needs of regional and global employers. Program data including available degrees, tuition rates and details about program coursework were collected from schools’ official websites, reflecting data for the 2018-2019 school year. Each school’s graduation rate, retention rate, and online enrollment percentages were also collected from the National Center for Education Statistics. All community colleges offering at least one online associate degree were considered eligible for rankings, and rankings were compiled for states with five or more eligible schools. Eligible schools were ranked according to their scores. These scores were calculated using an internal formula that incorporates retention rate, online enrollment percentage and the number of online associate degrees offered. Graduation rate or retention rate was weighted most highly in order to ensure that the rankings highlight the schools whose students are most likely to earn a degree. The SR Education Group has been publishing rankings of online colleges since 2009, and awarding scholarships since 2010. They commit to thorough research and fair assessment of all available online programs, with the hopes of helping students make educated decisions when choosing an online degree.